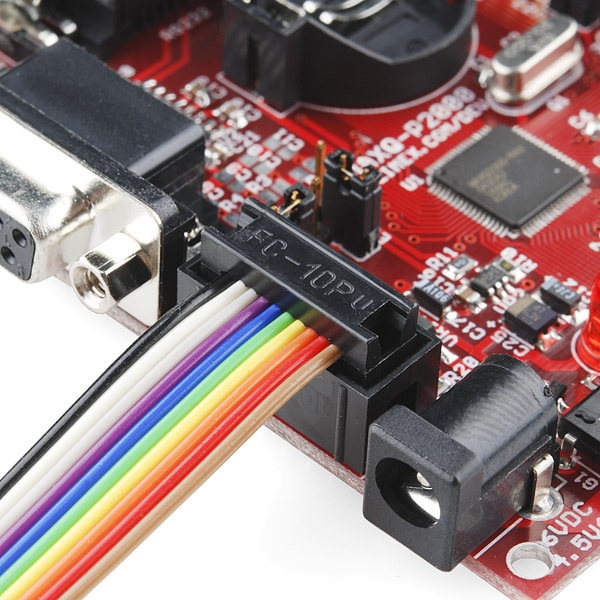 Ribbon cable is really helpful in situations where you need to make a lot of connections without a big mess of wires. Nothing makes a project look more finished than a nice clean wiring harness. This is a 15ft. 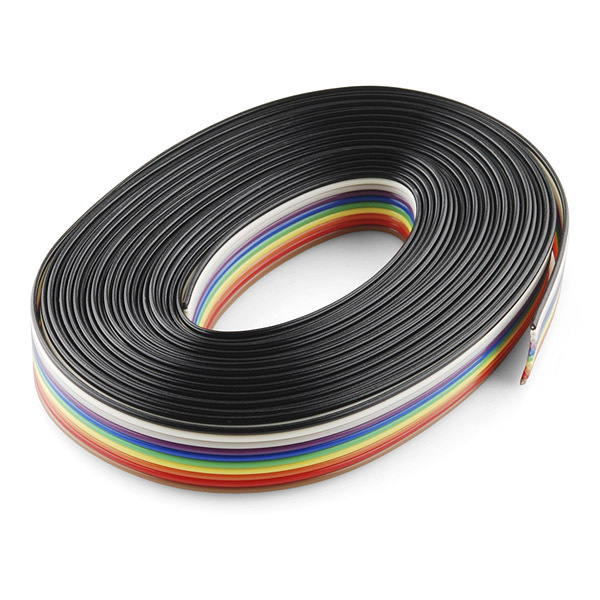 length of 10-wire ribbon cable. Check the related products below for crimp-on connectors that will fit this cable. What material is the wire? I need to know its resistivity. Can you tear off a group of wires from the 10. For instance could I easily turn this into a 4 wire and two 3 wire ribbons? why is this more expensive per foot than the 3ft section sold at $.95 (#10649)? 10649 is $.32ft and this is a penny more at $.33 per foot. Yes I know... but if you buy 10 qty of 10649 it drops to $.29ft and $.60 for this same length. because rounding, and because generally smaller quantities will cost a bit more. our quantity discount is also universal, so it just applies a set discount across all products. Is each wire 15 feet or is all 10 wires together 15ft so 1.5ft per wire? Is this solid core or stranded? Could the wires easily be soldered to a board instead of using a crimp connector? What voltage and current is it rated for? i.e. can I have 5V 1A going on these? While you'd have to check for your specific use (length, voltage drop, what temperature you're comfortable with, etc. ), the datasheet specifies the strands as 28 AWG and our handy dandy little workbook has values a fair bit over 1A. Best thing I ever owned! It is cable. All 10 of 'em. I checked. The only thing I didn't check was if there were all 15ft of it. But it was plenty for what I was trying to do so with a little left over so I wouldn't even be mad if it was short of the advertised 15ft. And let me tell you, it is the ribbonest and cablest of the ribbon cables out there - where exactly, i'm not so sure - but out there. worked exactly as a ribbon cable should. Used these as new ExxonMobil speed pass cables inside the gas dispenser electronis head. They cut nice, accepted there ends properly, and routed well. So far all has operated correctly. Will order again and keep in as spare stock. What can I say? Crimps nicely? Would love to write an Amazon.com worthy review, but I am just not that talented. Does exactly what it should. Didn't have to run a mess of single wires. I've begun using this cable for anything outside the local circuit. Even some local subassemblies benefit. First use was for a Raspberry Pi display and it worked great. Have since used it for short USB cables and anything else where multiple cables all go to roughly the same place. Very easy to strip off chunks of whatever you need and makes it easier to keep things together. What I really wanted was some small gauge wire (multicolored) for a project without having to buy 500 feet of it. Working out well for me. I bought this because i wanted to extend my graphical LCD screen from my 3d printer to the outside of an enclosure i built. as a result, i needed to feed the cable through a notch in the box, and then attach the connectors. Despite the LCD saying the cable must be 6 inches or shorter to work properly, I have two cables about a foot each and the screen and pot/button are all working properly. I have no complaints with this product and a bunch of spare as well. 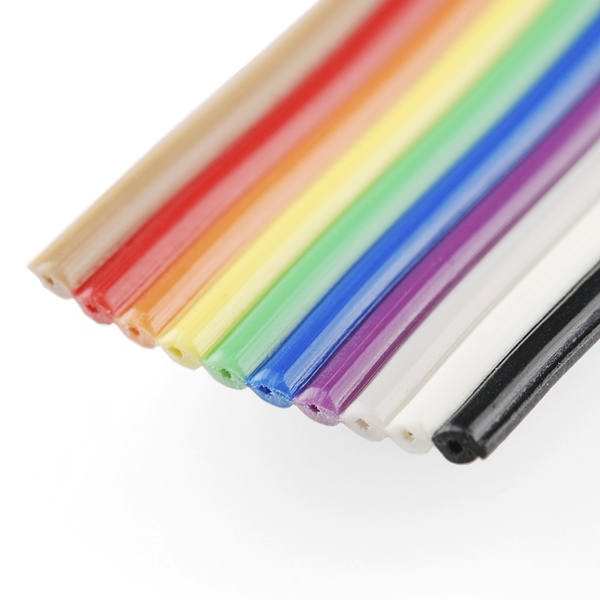 This cable is perfect for cutting down on the tangle of wires that a project can create. The cables don't separate unless you pull them apart, and the different colours make it easy to see the difference between wires. It is a bit difficult to separate the wires if you need to solder them to different places, and the insulation tends to melt with too hot an iron, but overall, I love it, and will be back for more soon. I haven't been able to find this kind of cable anywhere. I'm not talented enough to search for it on mouser. This cable will last a while and can be used in most wiring situations. Good quality. Good cable. The colors could be better - and are different from what is in the datasheet. I have another length of this from a different source and the grey is deeper grey, easier to distinguish from the white adjacent to it and more like what is in the datasheet. Also toward the other edge, there is a 'chartreuse' and a yellow, where I would have expected yellow and orange. But it conducts - I just have to be very careful with not mixing up the white and grey connections.